Diet in the wild: mostly fish, however they have been known to eat the dead bodies of humans found floating in the rivers of their habitat. 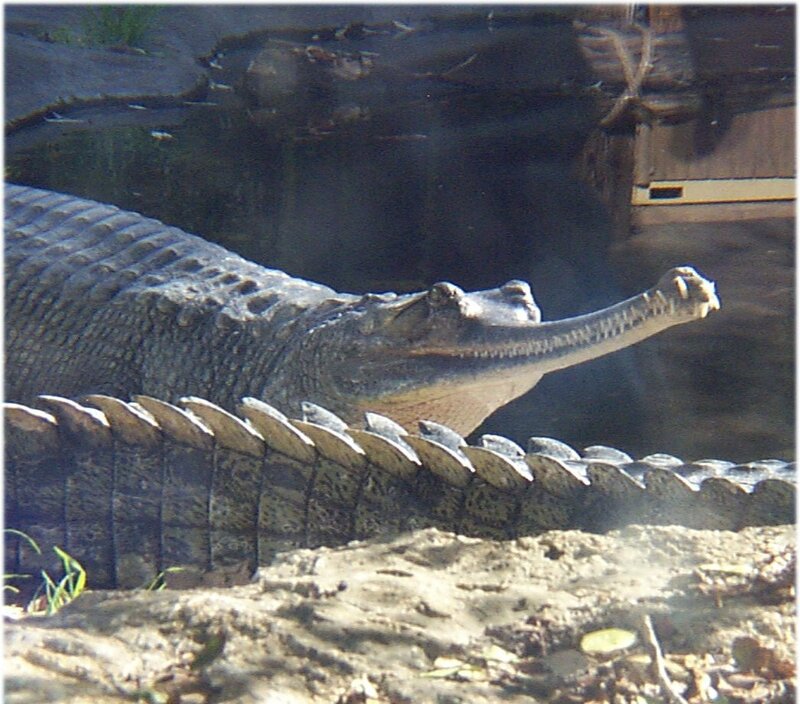 Physical description: The gavial attains a length of 4-5 meters long (12-15 feet). 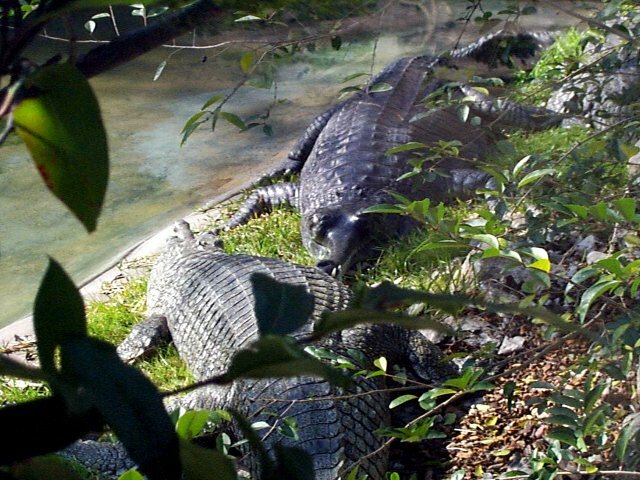 Its body looks almost exactly like that of an alligator, with its greenish scaly skin, long pointed tail, and short stubby legs. However, the most interesting feature on this animal is its snout. It is enormously elongated and flattened (almost like a duck's bill), and has upper and lower jaws that are studded with sharp-edge, close-set teeth. General information: The gavial is a timid animal, yet the very young individuals are more sociable. It reproduces by means of hard-shelled eggs laid in nests built by the female. It has been said that a skull of a gavial is strongly suggestive of a frying pan, the snout forming the handle. 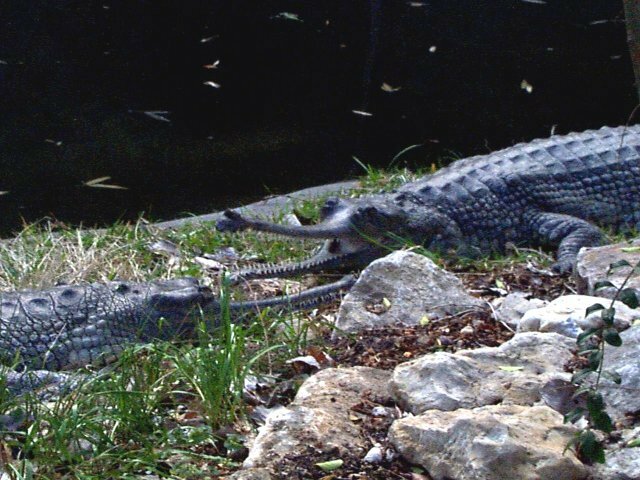 Special anatomical, physiological or behavioral adaptations: The snout of the gavial has adapted to its present form to make it easier to catch fish with. As the animal swings its head from side to side, the long, narrow snout filled with teeth acts like a trap catching many fish at once, thus making it easier to feed. Also the gavial is the most strictly limited crocodilian to its watery home, mainly because its legs have grown quite weak over time. The gavial has also become shy with the growing population of man in its habitat - dashing out of sight when someone comes around. Comments about the gavials of the Fort Worth Zoo: When I spoke to a man at the Fort Worth Zoo, he told me that there were 3 gavials at the zoo, I only saw 2 of them on my visits, but I suppose the other one could be hiding. There is 1 male and 2 females, and according to the zookeeper, they have no names (what a shame). Also, when I asked about their mating habits, he said that the gavials at the Fort Worth Zoo were too young to mate--they must first reach a length of 11-13 feet, and their gavials were only 7-10 feet. They are fed frozen trout with vitamin supplements, and the pool they live in is heated year round. The zoo received the gavials in 1992; the female gavials came from the St. Augustine Alligator Farm, and the male came from the Bronx Zoo. Personal Observations: When I went to see the gavials at the Fort Worth Zoo, every time I went I noticed how very still they were--they never moved once when I was watching. 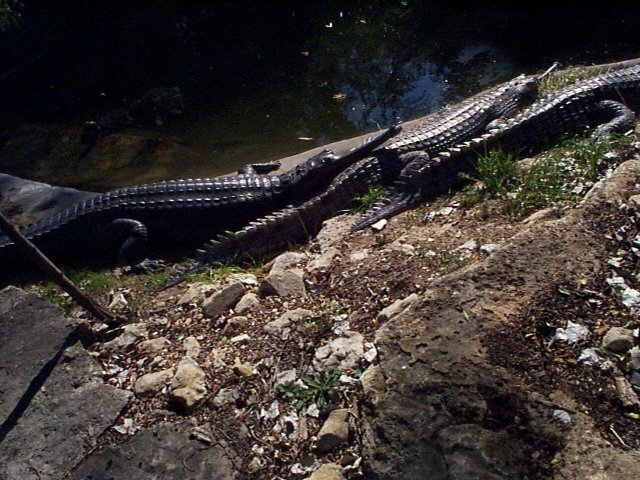 That's not to say they just don't move, that would be ridiculous, but it seems to me that their timidity is coming into play here as they are not prone to move when people are around. It was almost as if they were not real, simply statues representing their species. Ditmars, Raymond. Reptiles of the World. McMillan Co.: New York, 1922. Grzimek, Dr. Bernhard, Ed. Animal Life Encyclopedia. Van Nostrand Co. New York, 1975.